Angel Fire Resort has a variety of dining options from casual, family-friendly restaurants to classic fine dining. Hours: Open daily from 8 AM – 2 PM. 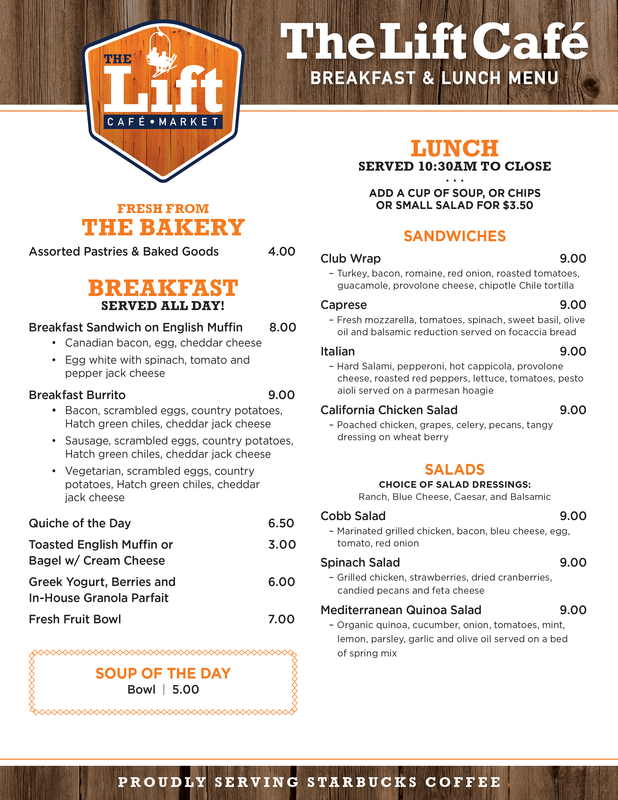 The Lift Café proudly serves Starbucks coffee, freshly baked goods, breakfast and lunch daily. Grab a homemade breakfast burrito (a local favorite! ), gourmet melt, wrap, or a salad. Beer and wine also available. El Jefe offers a Fresh Mex menu and a Mexican-themed bar located across from the Chile Express and the Angel Fire Resort base area! Serving a variety of delicious Spanish cuisine, including tacos, fajitas, and enchiladas and a huge selection of tap and bottled beers, tequilas and fine wines. Stop by and see what the friendly staff at El Jefe’s has to offer you today! Elements at the Country Club offers fine dining in a casual but spacious setting. Elements selects only the finest ingredients from local producers to ensure your meals are fresh and savory. Enjoy a wide selection of appetizers, steaks, seafood and light fares and a full array of beer, mixed drinks and fine wines. Private dining is available for families or small groups. Restaurant Hours: (Winter Only) Daily from 4 – 9 PM. Closed for Season on 3/24. Legends Grill is a family-friendly restaurant that offers a variety of comfort food dinner options including Ribeye Steaks, pub food, and a variety of gourmet Burgers. In addition to dinner fare you will also find a full-service bar with specialty drinks with Altitude Adjustment Hour Specials and a huge selection of tap, bottled beers, and fine wines. Stop by and see what the friendly staff at Legends Grill has to offer you today! Restaurant Hours: Friday & Saturday 4 – 9 PM. Closed for Winter Season on 3/24. The best pizza in Angel Fire. Chianti’s features a variety of specialty pizzas, as well as a build your own option. Call (575) 377 – 4203 to place your order to go. Kitchen Hours: Open daily 8 AM – 4 PM. (Winter Only) Closed for Winter Season on 3/24. When Night Skiing is offered, the bar will stay open as long as the lifts are running. Open for breakfast and lunch, the Village Haus offers a wide variety of family friendly foods with cafeteria style service. 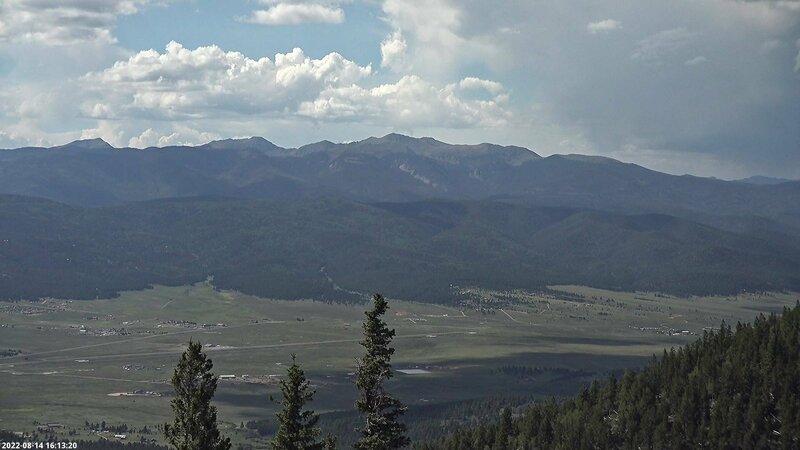 Just steps away from the top of the Chile Express chairlift, The Summit Haus features “top of the world” views that extend north beyond Eagle Nest Lake and all the way to Colorado. Enjoy burgers, sausages and more on our wrap-around patio. Full bar available. Start your day at the Par & Grill next to the Golf Shop and enjoy one of our breakfast burritos or classic breakfast menu items. After a round of golf, grab a burger, wrap or salad and sip a beverage from our full service bar while taking in the views. Both indoor and outdoor seating available.